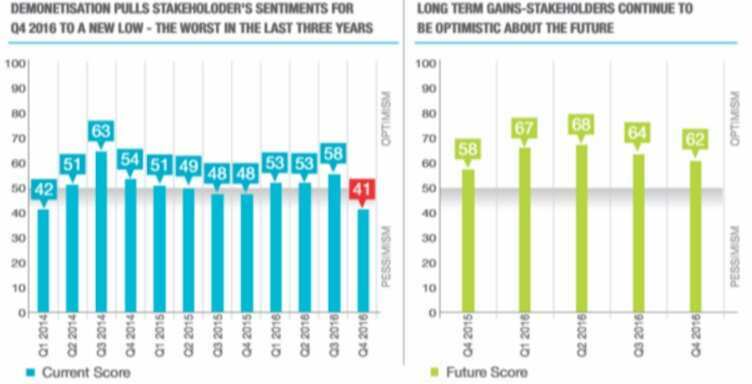 The score implied that the stakeholders' sentiments pertaining to the quarter is pessimistic. Hit by the demonetisation, the fourth quarter of the current financial year has become the work quarter in the last three years, in terms of 'current sentiment' score, a report said. According to a report by FICCI- Knight Frank India, due to the major disruption during Q4FY17 caused by demonetisation, the 'current sentiment' score has seen a drastic fall to below the threshold mark of 50, which is the worst score in the last three years. To measure the sentiments of the stakeholders, the research agency undertook a survey. "The respondents are of the opinion that the situation during the last quarter of 2016 was significantly worse compared to the earlier six months, reflecting the short term adverse impact of demonetisation on Indian real estate. The demonetisation move did infuse a high degree of uncertainty and confusion in the market but this impact seems to be transient in nature and the mid-to-long term impact is expected to be positive," Samantak Das, Chief Economist & National Director, Research, Knight Frank India said in a report. Demonetisation majorly hit the Real Estate sector in India as most of th transaction are done either in black money or in liquid cash. As per the report, the sales of residential fell in top eight cities by 40% in Q4FY17 as compared to Q3FY17, making it the worst performing year since the Global Financial Crisis. However, in hope of seeing the revival in the sector, 59% of the stakeholders believe that residential sales will improve in the coming six months, with the government initiating to bring in transperancy in the sector. Moroever, 45% of the respondents expect prices to remain stagnant while 26% expect a downward pressure on price appreciation, during the same period, the report said. "88% of the survey respondents believe that ofﬁce space leasing volume will either remain the same or improve in the next six months despite the Q4 2016 survey results showing that the level of optimism for the leasing volume has come down compared to Q3 2016," Das added.